This week’s decision by the British Government to renege on their commitment to hold an inquiry into the state murder of Human Rights lawyer Pat Finucane has once again reminded the world of Britain’s policy of collusion in Ireland. Collusion with pro-British death squads, including the UVF and the UDA, in the murder of its own citizens. 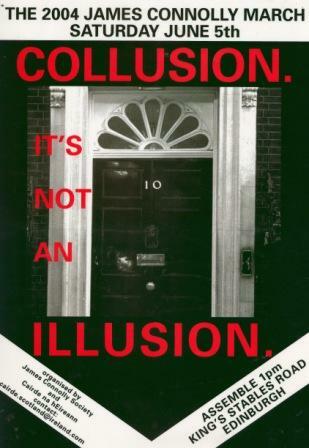 When the James Connolly Society brought out the above poster as part of a broader campaign to raise awareness of collusion it was dismissed by many as a republican fiction, a conspiracy theory – not any more. Collusion is not an illusion. The JCS campaign to highlight British state collusion was organised in conjunction with An Fhirinne who produced this short film.